Wedding ceremony or vow renewal, every couple has to choose a ritual for the D-day, that aimed to celebrate their union in a very personal way. The ritual can be lead by the wedding officiant, or the guests if wished. Below, you will find all of the materials needed and the symbolism of the best 10 rituals. 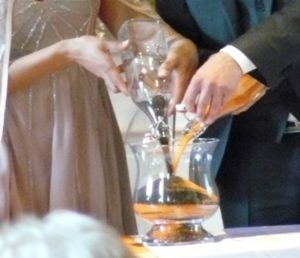 The bride and groom hold their bottle in their hands, and shed the sand together in the glass container. The bride and groom may possibly associate their children to the ritual. The two sand colors represent the two families. Shedding the sand at the same time in the same recipient symbolize the union of the two families through the wedding. It also symbolizes the respect of the difference between the two families and the two personalities. The married ones after having written personally their life vision in 5 or 10 years, roll together their to texts into the bottle (where they will live, how many children will they have, their working life, how will they celebrate their 10th anniversary ?…). They close the bottle, and seal it in the box. 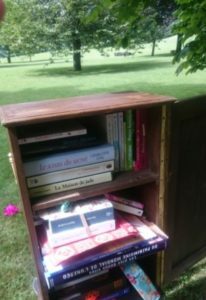 They can bury this box in the back of their garden for example, until their 10th anniversary to discover what their partner have written. It is a very symbolic and romantic ritual where you have to be patient. Rendez-vous in 10 years ! The married ones, after having chosen their bottle of wine, seal it on the box during the ceremony. They can then bury the box in their garden during 5 or 10 years. Very frenchy, this ritual need to be patient before being able to taste this wine for their 5th or 10th years anniversary. 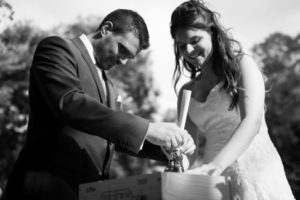 There is also a more traditional wine ritual which consist in drinking a glass of wine with your partner as the source of life. Before the ceremony, each future married ones write their fears on papers. A few hours before the D-day, each partner tells its fears to the other. During the ceremony, the couple burn their papers with a candle. This ritual symbolizes a new adventure through the union of two people, to move on and let the fears go away. Before the ceremony, the couple choose together a tree that symbolizes something strong to them. If they have the chance to unite in the family property then you can plant your tree directly in the garden. Otherwise, you will be able to lay down a tree to put it in a bigger pot. You can also involve your parents in this ritual. They will help you to plant the tree. This ritual is very symbolic because planting a tree represent the growth of your love and family for example. – the infinite: light on by the married ones to symbolize their eternal love. With each candle lighting, your loved ones can express themselves, and if they don’t know what to say, do not hesitate to tell them what you think of them and to thank them if you feel the need! There is also a variant to this ritual which is to give each guest a candle. Afterwards, the officer lights the candles’ guests sitting at the bottom, and each participant transmits its flame to their neighbor until it arrives to the bride and groom, who used their candles to light on a larger candle. Each candles represent a part of your life, and the guests that participates to this ritual can be involved in your unity. An easier way to use candles as a symbol is the Unity candle ritual. It consists in lighting up a candle with your partner at the same time. Each of the bride and groom hold a candle that represent themselves and their family. It is a symbol of unity. Before the ceremony, the married ones ask their guests to dedicate a book to them that could represent the couple. But it also can be a book that the couple could like to read. Then, each guests during the ceremony stand up and put the book in the bride and groom’s bookcase to fill in it. This ritual is very old, it was practiced by the Greeks and the Romans, but also by the Celts. 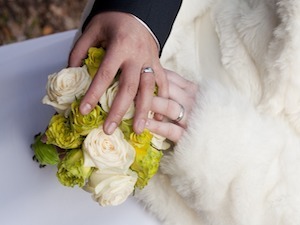 With the hand-fasting, the bride and groom symbolizes their union and their commitment to each other. A few hours before the ceremony and the arrival of the guests, on each seat is placed a pebble and a black felt. During the ceremony, the guests write a few words to the bride and groom. Then, each guest put his pebble in a vase which, at the end of the ceremony, will be given to the bride and groom. This communal ritual is a way to involve your guests into your union. 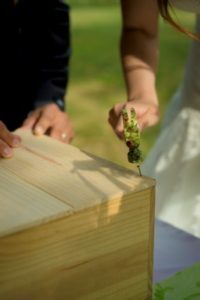 This ritual allows you to keep good memories from your ceremony. 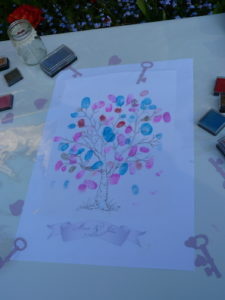 Each married ones and guest will come to put their stamp on the branches. Each print symbolizes a leave. This communal ritual is an opportunity to include your guests to your ceremony but also to keep a memory of your union. Now that you know our Top 10 rituals of symbolic ceremonies, it’s up to you to choose the one that fits you the most! Nevertheless, if you wish, each ritual is customizable. To tell us about your symbolic ceremony project, do not hesitate to contact us!